me and him: so jason got in. a little stumped about philly + cali. well. last night we made a decision. we're seein sunny california in our future. anyone wanna come visit next fall?? 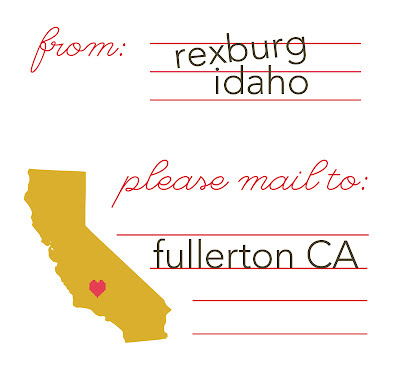 printable mailer graphic from oh hello friend. I'm there! That's so exciting for you guys. Mostly for the good weather. yay!!!! ughhh!!!! i want to move there!!! away from this blasted snow! Is there anything cool to do or see there? Maybe I'll come visit. I've got nothing else to do! Congratulations! Those are such big/difficult decisions to make (especially since you had so many options). I bet it feels good to have it decided. yay yay! california is the best! congrats you guys! i am so excited for you! wooooo! i had a feeling california would win in the end! it's pretty great here. congratulations on your decision! Told you that he'd get accepted by all three! Congrats & Cali sounds great to me. We knew you'd make the right choice! hehe Good thing you're makin' bank at Rexburg Vision Center to afford those seat-savin' fees. Yay! We're excited for you! WOOHOO! Good for you guys! Congrats on the official decision. And GOOD JOB jason for being such a smart cookie :) That's really exciting! WAY TO GO! How exciting for you two! How Exciting!!! Sheesh...that's nice to have options...CA would probably be my choice too...at least for winter that is! I wasn't too fond of Portland. How long will you be there? I'd love to come see you in southern California. Aww! we are going to miss you! Congrats though! Now you have given us a good excuse to go on a nice warm vacation!